Though Skype doesn't provide native support for recording voice conversations yet, you can easily record Skype Call Sessions using third-party add-ons or hardware devices or even with software that already exists on your computer. The Skype Phone calls are recorded to regular audio files like MP3, WAV or Windows Media which can edited and shared with friends like regular media files. » Skype will save the voicemail locally after you've played it but it uses some odd format. 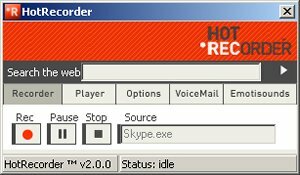 To convert the skype dat sound file to MP3 or WAV, use HotRecorder mentioned above. » Before placing Skype call or recording conversations, it's always nice to test your Skype Sound Setup. » Skype is favorite utility for recording podcast interviews. Here's an excellent tutorial on how to record Podcasts with Skype on Mac or Windows. It uses the software discussed above. Update: Download Skype Toolbars for Microsoft Office, Internet Explorer, Firefox, Outlook or Thunderbird.